I almost coughed up a hairball reading about the cat fight that ensured on social media as women howled their outrage at Frankel. The fur started to fly when according to some, the anorexic actress was exploiting her little girl. Others meowed that she was forcing her child to compete with her. This wild cat of an inadequate parent was destroying the self-image of girls and fluffy kittens around the world. Some allowed their claws to come out and ripped her to shreds on Twitter. They accused the tiny want-to-be actress of eating like a mouse and encouraging bulimia. I suspect that many of these cat-calls came from those with an excessive body mass index, so I stopped reading the comments and moved them to the litter box. Such unwarranted outrage left me scratching the couch. Get a life, already. For more than thirty years of my adult life, I’ve witnessed the unnecessary vitriol exchanged between women. Before I fade away into the genderless old folk’s home, I’d like to see women celebrate each other instead of fighting like felines in heat. Really, it’s okay if a reality show star wants to wear her kid’s clothes. Those who are foaming at the mouth in disgust need to watch the news to learn from the legitimate reality shows about what really matters. Wars, famine, abuse, stupid politicians – these are all far worse than Bethenny Franklel wearing Hello Kitty slippers. When I returned the t-shirt to my granddaughter, she asked to wear my old outfits for dress-up clothes. We were delighted as she pranced about in the discarded power dresses of my past life. And, to my knowledge, not one other 7-year-old criticized her for wearing my clothes. Perhaps there is hope for the younger generation. While I didn’t go overboard and I didn’t get my claws out, I’ll admit it – I judged. I’m not a big fan of hers, but I probably would have reacted anyway. I thought it was kind of scary to see her in a 4-yo’s outfit. I just don’t get it. I get your post, though. And agree. We should all kind of mind our own business. And yet – she put it out there as a “celebrity” of sorts, so I am not surprised about the loud reactions. 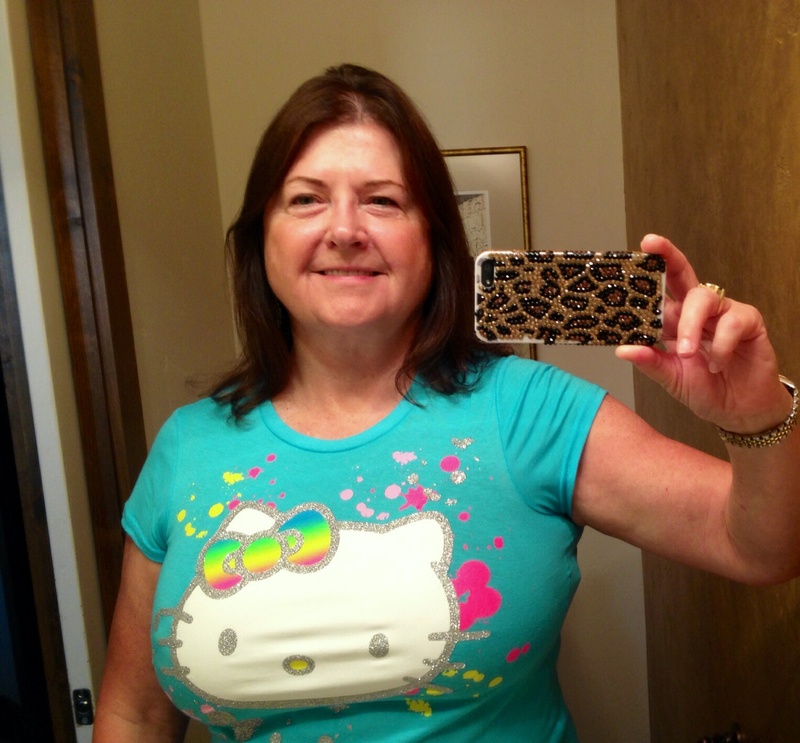 If it makes any difference, I think YOU looked great in Hello Kitty! Who cares who wears Hello Kitty shirts? I have one in my ample size, and I love it. So do little girls who see me wearing it. Let’s be supportive of our differences and our sames. Women who tear each other down are insecure and have a poor self image. That is not something we want to pass on to our children and grandchildren. You are right! Women unite, whether it is over our Hello Kitty jammies, or a great glass of cabernet. Cheers! Live and let live, I say. On the other hand, by wearing her 4 YO’s clothes is she perpetuating the stereotype of the small, waiflike glamorous woman? I must admit I found that picture to be beyond bizarre. It made me a bit uncomfortable but it wasn’t worth more than 2 seconds of my thought. In my mind I said to myself “another crazy bit”. My outer self chose to move on. Life is way too short to spend it on stuff that doesn’t matter, isn’t my business or doesn’t affect me and those I love. With regards to supporting one another, wouldst that it could be so! Interesting fact – you can get just about anything with Hello Kitty on it. Type google “Hello Kitty Blender”. Don’t believe me? Try fire extinguisher. Anything. Got distracted. You’re right. I judged. I just don’t appreciate Bethanny though. I don’t think she’s very good.